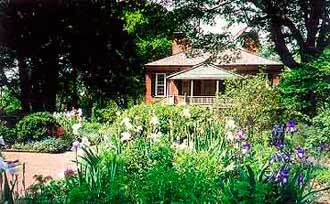 a 14-room Federal-style home which was built for John and Lucy Fry Speed and their family of 13 children in 1815-1816. 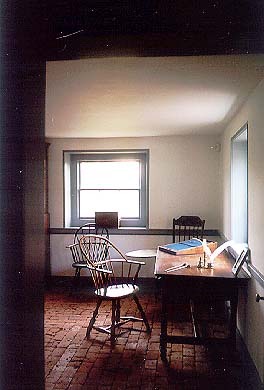 The unique architectural plan of the home includes two octagonal rooms imbedded in its center, strongly suggesting the influence of Thomas Jefferson. worked the fields at Farmington and served in the house. Their labors made possible the Speeds' lifestyle and, indeed, the house itself. A few accounts of the African Americans at Farmington have survived in family letters which talk about Morocco and Rose among others. Runaway slave ads placed by John Speed describe other slaves in some detail. On-going research is attempting to uncover more about the 57 slaves named in the inventory completed when John Speed died in 1840.
building to its original bright blues, yellows and pink. New faux-grained woodwork mimics original decorative paintings found on many surfaces. Even the walls in the basement have been white-washed as they originally were. Much of the restoration work is based on the 1840 inventory of John Speed's possessions taken at this death. This detailed listing itemizes everything in the house at that time from carpets, curtains, window blinds and furniture to bedding, tableware and cooking equipment. Many decorative elements including ingrain carpets, wallpaper, curtains and bed dressings are being very accurately reproduced for Farmington using documentary designs appropriate to the period. 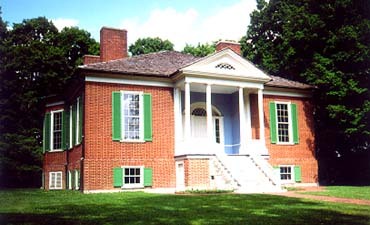 As much as possible, restoration decisions have been based on research into what was available for sale in Kentucky from 1815 to 1840. Today, along with the restored plantation house, Farmington features a spring house and barn reconstructed on its original foundations, a functioning summer kitchen and blacksmith shop, as well as formal gardens and an apple orchard. An archeological dig on the property has revealed a cabin site, which possibly served as the home of the Speeds before the construction of Farmington. Artifacts reveal that it may also have been a cabin for a family of the Speeds' enslaved African-Americans. The Farmington Visitors Center houses an historical exhibit on Farmington, administrative offices and a gift shop. Farmington is open year-round Tuesday through Saturday beginning at 10:00 a.m. Tours begin on the hour with the last tour starting each day at 3:45 p.m. Sunday tours begin at 1:30, 2:30 and 3:30 p.m. Group rates are available for both student and adult groups. Call (502) 452-9920 for further details.